We came out of winter with two out of three hives having survived. One hive was wiped out by starvation. Then one of the surviving hives was attack by skunks. It was the smallest hive that I didn’t think would pull through the harsh winter. I was really discouraged and guilty too, as a matter of fact, by the whole situation. I fed both surviving hives as soon as the weather permitted, one gallon of sugar syrup each, and hoped for the best. Once they started foraging, I stopped feeding them. 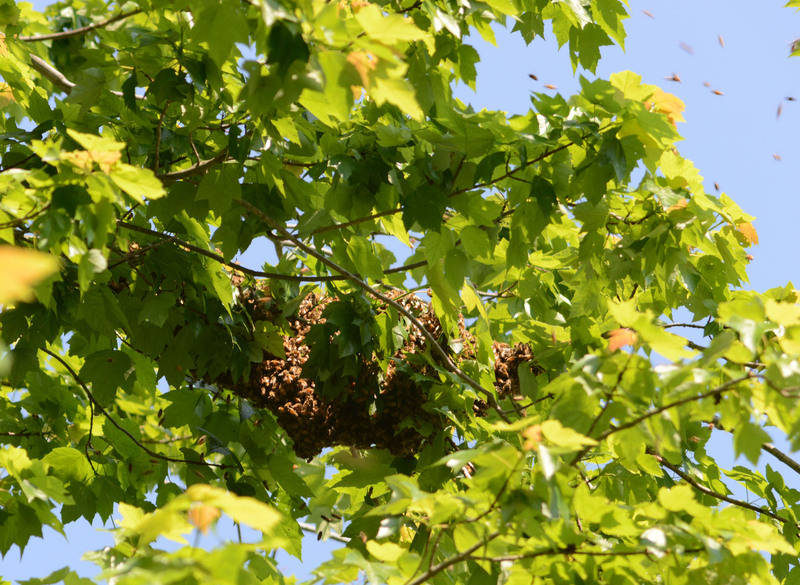 On the morning of May 20, with high temperatures and plenty of sunshine, the first hive swarmed. I caught just a few of them and set up a new super to house them. The swarm prompted me to do a complete inspection of both hives right away. 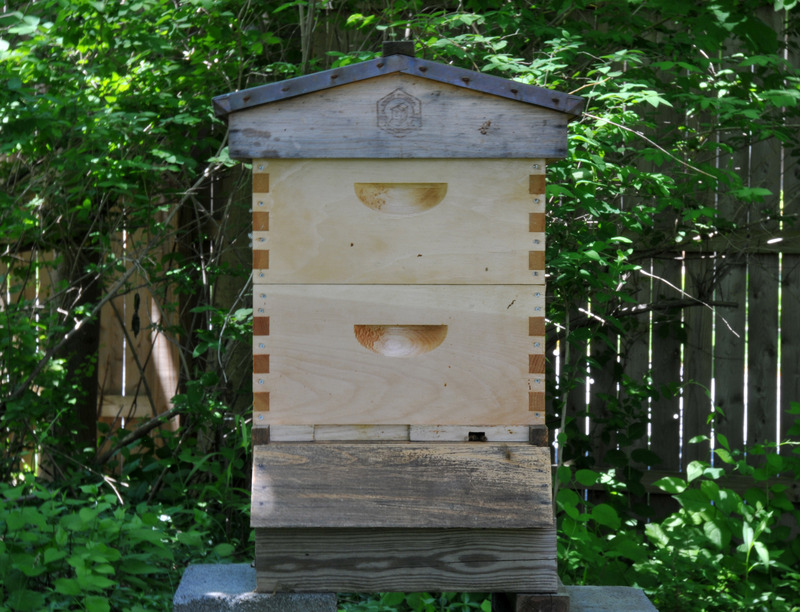 The second hive, smallest of the two, had a healthy population, though not plentiful. I couldn’t find the queen but there are some larvae in there. No mites, no moths, so I left it alone. The first hive is the problematic one. After the swarm, there were still plenty of bees in the hive, too many and too crowded. I decided to take two brood frames with one queen cell attached (wasn’t sure I got the queen from the swarm) and two honey frames from this hive to help the bees I caught from the swarm set up their new colony. I closed all entrances with screen and locked them in for a day in their new home. I replaced what I have taken from the first hive with new unused frames to provide more room. A couple of days later they acted like they wanted to swarm again. So, I decided to split the colony to prevent them from swarming. I took a whole super with two queen cells (more mature cells than the first one I had taken) and some brood frames and bees from the first hive and combined them with the new hive. If everything goes as planned, the first queen that hatches will kill off the other two. I’ve taken the bottom super from the first hive. The middle super is the swarm I caught, with a piece of newspaper in between to make sure that they merge well by let them chew through slowly. The top super is empty, just used to cover a top feeder. I also closed the top entrance with screen so the weaker swarm bunch won’t get robbed but they can still go in and out from the entrance between them and the super below. 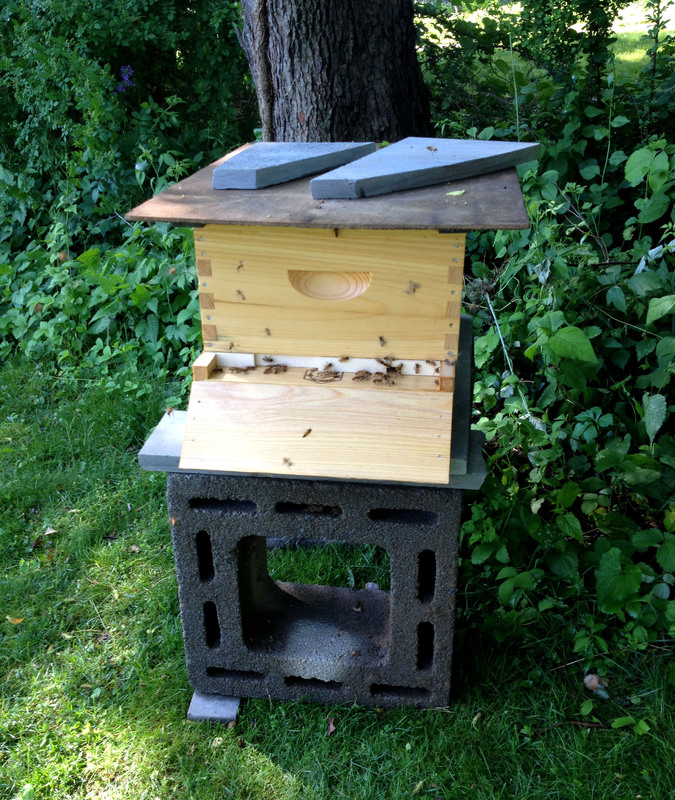 The third hive now, with the newspaper, shim and top feeder out. They get along well and are busy foraging. Back to the first hive, I added a queen excluder and a new super on top of it. I also opened the entrance completely for better airflow. So now this hive has a whole new eight frame super on top of the queen excluder plus four new frames in the brood chamber, and the entrance is also wide open. I thought I had done enough for them but I guess Her Majesty thought otherwise. They swarmed again on June 3rd. This swarm was larger than the first one. I caught most of them, again wasn’t sure I had the queen. If someone tells you that getting a swarm from the lower bush is easier than from a tree branch, keep in mind that it’s not always true. It suggests that the person has never experienced retrieving a swarm from a thorny rose bush. I house them temporarily in one of the empty super’s with my last remaining frame in it. No cover either, I’m using a piece of wood and two bluestone pieces to weight it down. 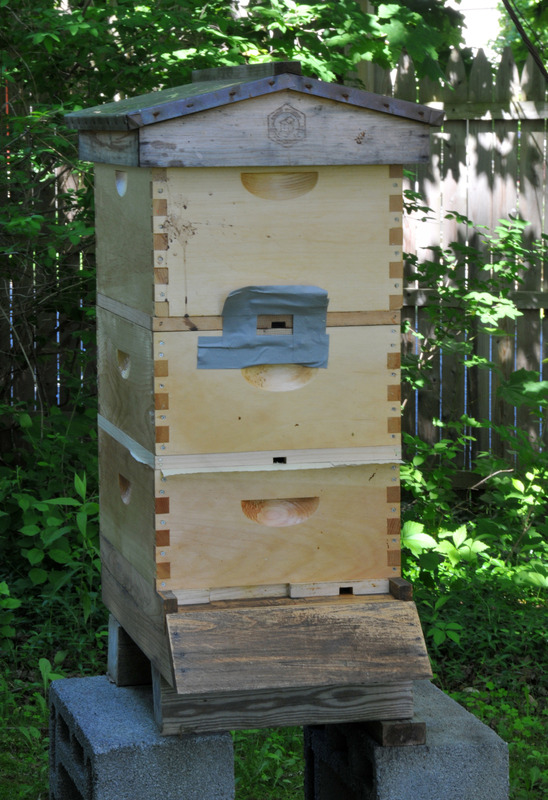 Hopefully, an order for new equipment will arrive soon before they start building comb on the inner cover. I don’t want to feel guilty for having to destroy their hard work. It would also be a little set back for the bees as well, to have to build the whole thing all over again, albeit, I am providing them with a beeswax foundation in each frame. I’m housing the second swam with what I have, a base, screen bottom board, a super, one frame and a wooden board as a roof. They’re busy bringing in pollen and nectar now. 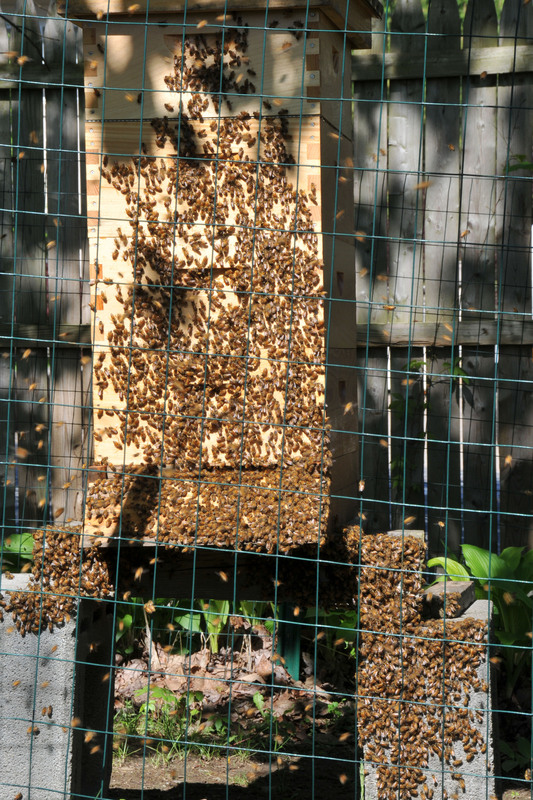 Your bees are really keeping you on your toes this season. They take a break from swarming now but I have a feeling that this hive will do it one more time. The second hive looks too crowded too.